Helena is an Amel Super Maramu. Henri Amel, who was known as “Le Cap’tain” has designed the Amel ships as cruising ships that “both rule and respect the elements”. We have found this to be a really good description of our ship. The Amel yard has built ships since 1965 and the same basic design has been used from the beginning to the latest designs. The only changes were in size of the ship, provisioning and modernization of the on-board equipment. Henri Amel describes his designed ships as “Yachts that are true to the sea”. The first impression when you get on board of any Amel ship is that everything is built for simplicity, practicality and endurability. This is of course also the case on board the Helena. The ship has all comforts and facilities needed for long term travels at sea. From a desalinator for making drinking water from sea water to easy accessible wiring to spacious areas for storage and living on board. All normal berths (6) are seaberths which can be used during sailing. The additional optional berths are not seaberths and can only be used when the ship is moored or anchored. The aft section of the ship has a double seaberth with a separate bathroom. We then have the Pilot berth in the hallway from the main cabin towards the aft with one seaberth. The main cabin has one seaberth and an optional double berth. Finally, there’s the front cabin which contains 2 seaberths and 1 optional berth and a bathrooom. 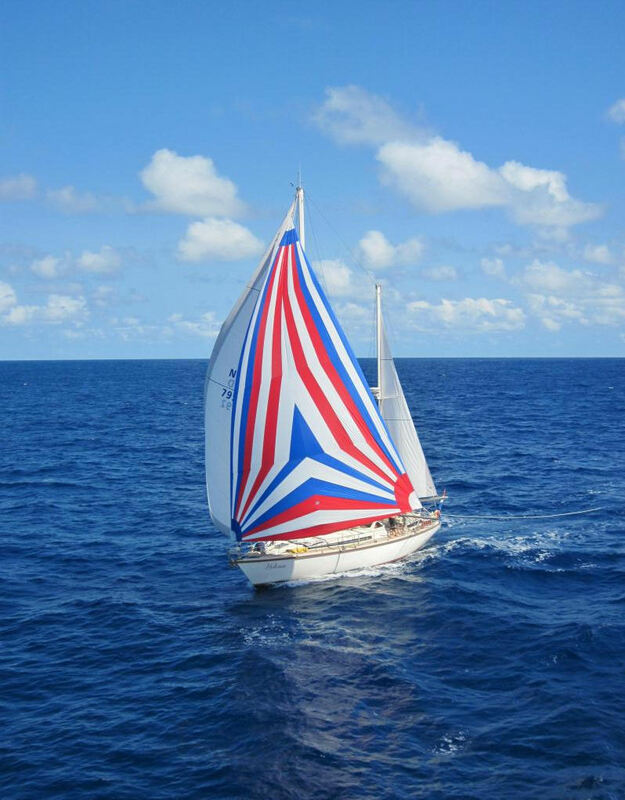 Helena is provisioned with all the comforts for on a tropical sailing experience. First of all we have two bathrooms with hot showers, toilet and sink. One is located in the front and one in the back. We also have two deck showers with hot and cold water. For all this water, we have a tank in the keel which has a capacity of 1000 liters. For the warmer climate we have air conditioning on board in the main cabin (with airducts to the front) and in the aft section. We also have a dishwasher and a washing machine on board, together with 3 large fridges with freezers. To use all this equipment, we have a generator and sufficient batteries to ensure a comfortable stay. Of course the generator and the engine use diesel, so we have a diesel main tank which can hold about 600 litres of diesel and a secondary tank with 260 litres. The main living areas are the main cabin and the cockpit. The main cabin is comfortably designed and can be used at all times. The cockpit is very comfortable with cushions and a large removable table. We even have a lounge deck on the aft with large cushions. In order to protect you from the sun, we have sunscreens that cover the entire deck from the bow to the stern. Helena is completely provisioned for long term ocean trips and equipped with an Epirb (Emergency Position Indicating Radio Beacon), short and long distance radio equipment, satellite phone, (epirb) life jackets, rescue equipment (liferaft, slings, buoys etc), flares and much more. Furthermore, all areas on board contain fire extinguishers, smoke detectors and can be sealed off with watertight bulkheads and there are sufficient medical supplies on board.